If the rotor of 3 phase induction motor is locked and stator is free to rotate, then would stator rotate? If yes then in which direction? In normal conditions, it cannot happen. If the load on the shaft of an induction motor would be such that the motor cannot start, and if there would be no protection of the induction motor, then the stator winding would just burn down. BUT if the induction motor would run at full (rated) speed and if the rotor would be blocked instantly, then it could be possible. This is under the assumption that the motor has really tight/good connection with its frame, so that it cannot be ripped from the frame due to the mechanical force that would appear. 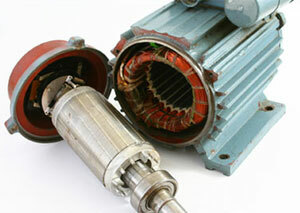 Stator would rotate in the opposite direction of the rotor. Newton's Third Law holds true: "For every action there is an equal and opposite reaction." This means that with a rotor turning in one direction, the stator is ALWAYS trying to turn in the opposite direction. "Normal" construction holds that the stator is firmly affixed to a large stationary mass (e.g. the foundation). The rotor is connected to the driven equipment (at one or both ends of the shaft) and is free to turn. Electrical connections to the two are such that the cabling/busbar/etc is not limiting the mechanical motion. Some machines (e.g. high speed dynamometers) do NOT have fixed stators per se, but have a very limited range of motion (in the preferred direction of rotation, at least). These machines use the reaction to the rotor movement (mechanical forces exerted by the driven equipment) to measure torque production through the use of a calibrated load cell. The "torque arm" of these machines is simply an extension of the stator that makes contact with the load cell. If the design of the foundation is incorrect, it is entirely possible to "rip" the stator off its mounting and have it try to go tumbling away. Foundation design, in this case, refers to the combination of: actual foundation material (typically concrete), soleplates or bedplates used to support the rotating machine, the bolts or other fasteners embedded in the foundation structure, the bolts or other fasteners used to hold the machine to the soleplate or bedplate, and the induction motor mounting surface (frame foot). I've seen it happen - primarily under short-circuit fault conditions. The instantaneous torque resulting from the high fault current overcomes the mechanical holding force of the foundation, and the stator tries to "roll away". Note that the rotor does not have to be "locked" for this to happen, either!